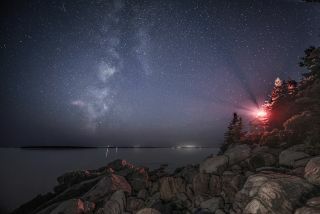 The Milky Way and Bass Harbor Head Lighthouse at Acadia National Park in Maine, captured in summer 2014 by astrophotographer Ray Yeager. Now that the bright moon has moved out of the evening sky, skywatchers have a great chance to view the early-spring stars. And yet, even stargazers who are far from the scourge of light pollution will notice that there is something missing from the current view of the Northern Hemisphere sky. The best time of the year to see the Milky Way is during the late summer and early fall, when its brightest portions run from the southwest to the northeast parts of the sky and arch nearly overhead. But, at this time of the year, during the evening hours — even with perfect conditions — the Milky Way is invisible as it runs along the horizon, where it is hidden by the denser atmosphere near the ground. If you look nearly overhead this week at around midnight local time, you won't see the Milky Way, but rather a fine star cluster that appears as a faint shimmering patch of light on clear, moonless nights, best viewed with a good pair of binoculars. This pattern of stars is the constellation that owes its name to a theft: Coma Berenices (also called "Berenice's Hair"). Berenice was an Egyptian queen, the wife of Ptolemy Euergetes, who reigned around 250 B.C. She sacrificed her beautiful amber tresses, the story goes, and placed them in the Temple of Venus at Zephyrium, as she had vowed to do if her husband returned victorious from his war against Babylon. But the queen's hair was stolen from the temple, and she became distraught. The astronomer Conon eventually convinced the disconsolate queen that Zeus himself had taken the locks and put them up into the sky. Such is the story of how the cluster got its name, though this region of the sky was not generally recognized as the separate constellation of Coma Berenices until the beginning of the 17th century. There is a good reason Coma Berenices is highest in the sky when the Milky Way appears at its lowest. From our Earthly vantage point, every star that we see in the night sky is part of our galaxy — the Milky Way. The sun and our solar system are situated in one of our galaxy's spiral arms and are located about two-thirds of the way from the center to the far edge of the main part of our galaxy. The Milky Way is shaped like a disc, and most of its mass and stars lie in the relatively flat "galactic plane." The two points that are farthest from the galactic plane are called the galactic poles. As it turns out, the north galactic pole is located very close to Coma Berenices. So, when Coma Berenices is highest above the horizon, as is the case now, the galactic plane (sometimes also referred to as the galactic equator) runs more or less around the horizon and is usually hidden by low-lying haze. So that's why the Milky Way runs low when Berenice's Hair rides high. Or, as the late popularizer of the sky Hans A. Rey wrote in his popular guidebook, "The Stars: A New Way to See Them" (Houghton Mifflin, 1952), "No hair can ever get into the milk, celestially speaking." Editor's note: If you capture an amazing view of a night-sky sight and would like to share photos with Space.com for a story or gallery, send comments and images to managing editor Tariq Malik at spacephotos@space.com.